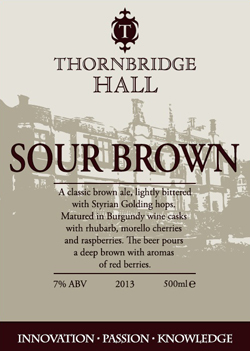 Sour Brown is brewed with Styrian Golding hops and matured in Burgundy wine casks with rhubarb, morello cherries and raspberries. From a leading English brewery, the deep amber-red beer has a massive aroma of sour fruit, with cherries to the fore. The sourness is less aggressive in the mouth, with rhubarb making a strong entrance alongside bitter cherries, peppery hops and dark grain. The finish is long and bittersweet, with tart fruit dominating, but there are continuing notes of rich grain and bitter hops. Impatient in its handsome bottle, this beer made a quick bid for freedom and was stopped only by a quickly deployed glass. I’m glad it didn’t escape, because it smells awfully nice—a combination of leathery Brett funk, old Madeira, earthy fruit and a hint of balsamico. Acidity and light bitterness focus nicely together up front, opening onto caramelized fruit flavors and a dry, well-defined finish. An elegant beer of considerable complexity. It’ll be awesome with game meats.